View A/R Communications ― allows the users to see the AR notes. Edit A/R Communications ― allows the users to edit AR notes. Export A/R Communications ― allows the users to edit AR notes. Access Accounts Receivable ― allows the users to access to AR and adds it to the main menu. Apply Finance Charges ― allows user to apply finance charges to overdue invoices. Create Entry ― allows the users to create an AR entry. View Closed ― allows the users to view the closed/paid invoices. Override Hold ― allows the users to take an invoice that is on hold and release it. Modify Finance Charge Rate ― allows the users to modify the default finance charge that is about to post. Unlink Transactions ― allows the users to unlink transactions. 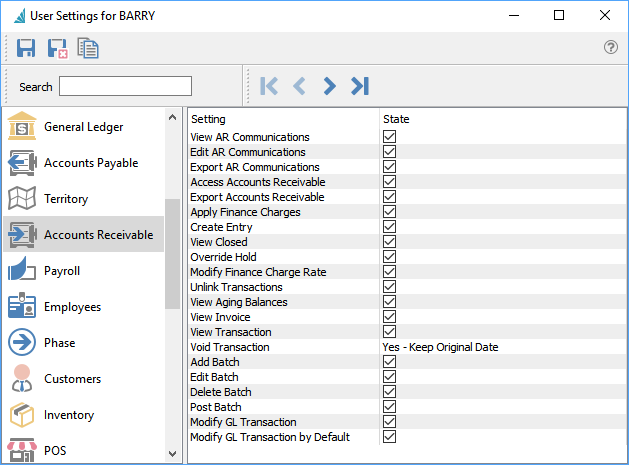 View Aging Balances ― allows the users to view the customers aging. View Invoice ― allows the users to view the source invoice. View Transaction ― allows the users to view the journal entry associated with an AR entry. Void Transaction ― allows the users to void a previous payment. There is an additional setting to determine what happens to the date in the reversal.